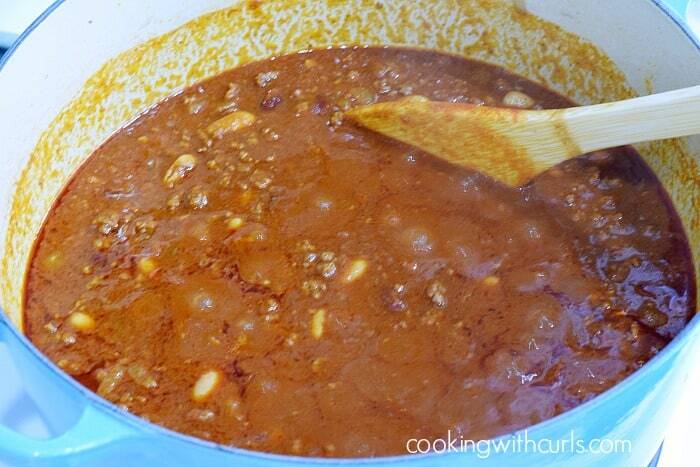 I was originally planning on sharing this Guinness Chili recipe on Monday, which was National Chili Day. I got up all excited about writing the post, but did not pull out my menu checklist first. Yes, I have about 3 weeks worth of menu ideas written down based on upcoming holidays and what I feel like making. There are also notes off to the side for national days about food that might be helpful or interesting to try…..
On a happier note, it finally stopped snowing and it looks like the sun is trying to poke thru the clouds. It has been snowing for 2 days now…it needs to stop! Like permanently stop until next winter. Cedar Rapids had a foot of snow during the month of February alone. We will have to see what happens next week, it might be in the 50’s, you never know with Iowa weather what will happen next. 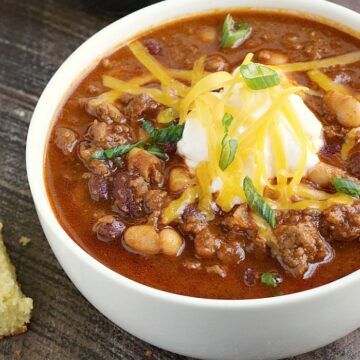 No worries, you can warm yourself up with a big bowl of Guinness Chili on those cold snowy nights. Maybe that’s why we have winter, so we can make awesome hot foods! This is a mild chili, I do not like spicy. 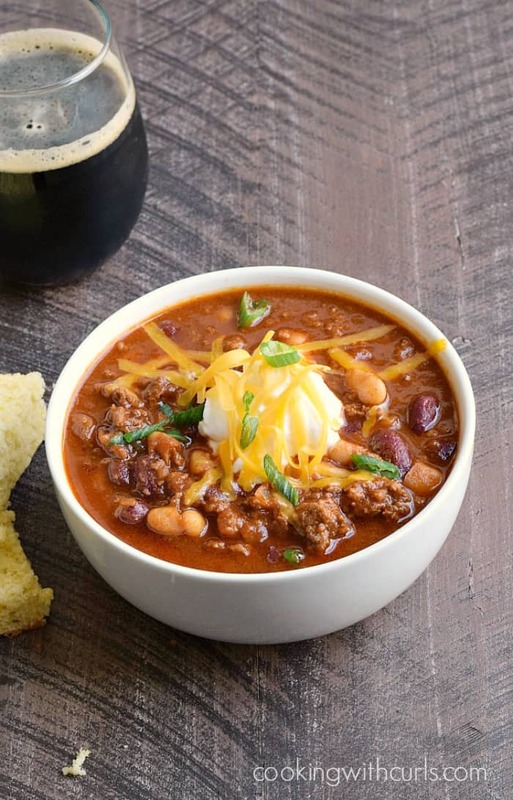 No, it does not have a strong beer flavor, it is just a subtle flavor in the background that adds a unique twist to basic chili. Heat oil in a large Dutch oven over medium heat. Add the onion and cook for 3 – 4 minutes. Add the ground beef and garlic. Cook until meat is no longer pink…..
Add cumin, chili powders, tomatoes, and beans…..
Add the Guinness® and brown sugar, stir….. I usually serve my chili with cornbread or corn chips, but never over noodles. Who knows, maybe I will try that next. 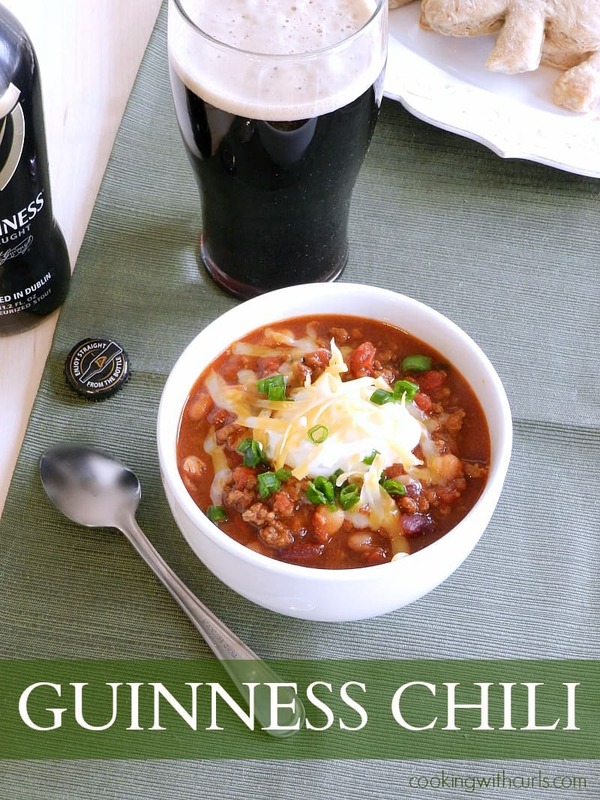 Guinness® Chili is perfect for St. Patrick's day, game day, or to warm up on a cold winter night! Heat oil in a large Dutch oven over medium heat. Add the onion and cook for 3 - 4 minutes. 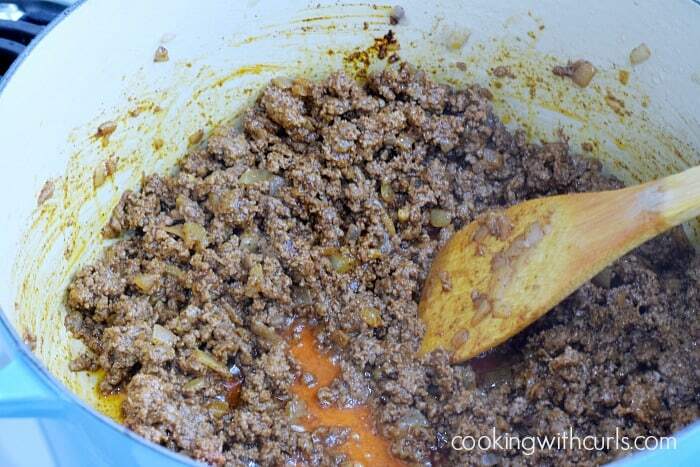 Add the ground beef and garlic. Cook until meat is no longer pink. 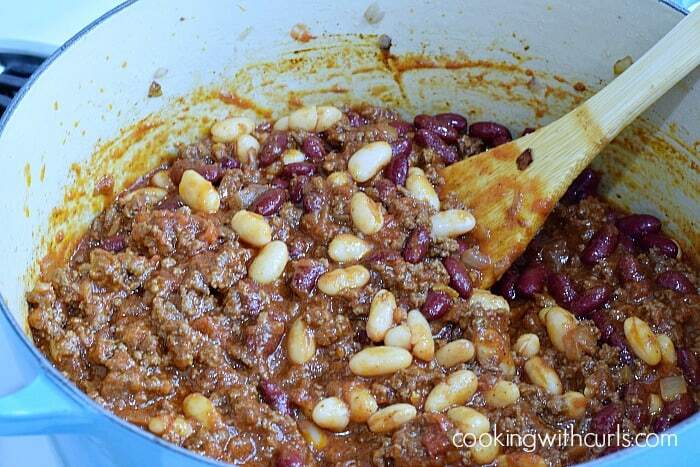 Add cumin, chili powders, tomatoes, and beans. Serve with sour cream / Greek yogurt and shredded cheese if desired. I always add sugar to recipes with canned tomatoes, it helps take the acidic edge off. *Guinness the name, the harp logo, and the signature are all registered trademarks. I have no affiliation with the company and I am not being paid to use their beer. I just really like cooking with it! I love this idea! I’ve been wanting to make a main course with Guinness, so I definitely want to give this a try. So I made this chili last night and it was phenomenal! I only made a few changes…nothing much…and I posted it today. Of course, I noted that I found the recipe here. It was a hit in my house! I served it with cornbread waffle triangles, which I will post Sunday night! Thanks, Lisa. This recipe sounds delicious. I always make my chili with beer, it just goes together. Thanks for sharing this with Foodie Friends Friday Chili Party this week. I’m sharing this on my FB page this afternoon. G’day Lisa! Love the combination of Guinness and chilli! I really love the colors of your new site, looks great, Lisa. Thanks for joining me at Sat.Dishes pinning and buffering your chili ! 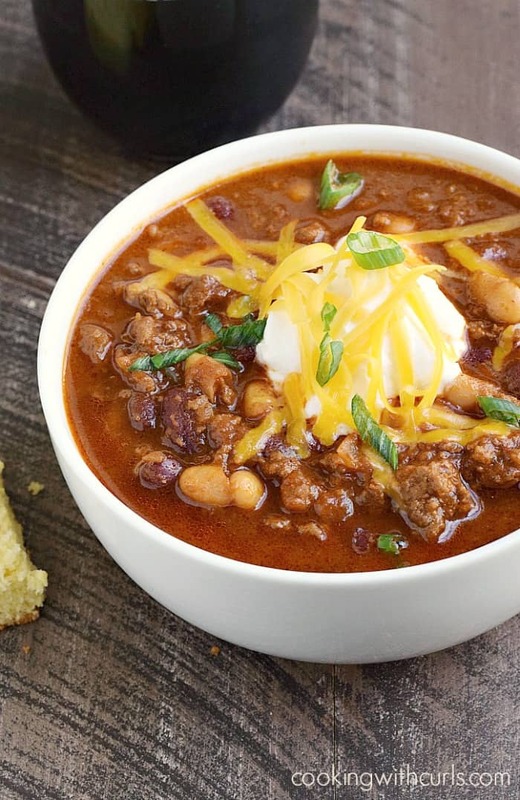 Chili always goes great with football. I pinned it! Thank you so much for linking up to Saturday Dishes. I Pinned it!! Mmmmm, this looks like perfection, Lisa. 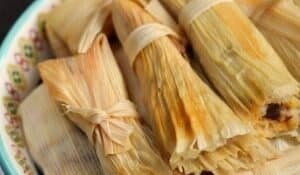 I love chili and always looking for another great recipe. Thanks so much. My mouth is watering! 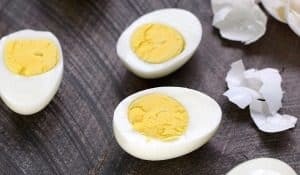 I had to tell my husband in the other room–he is going to make this today! Thanks so much for the post, and I have pinned it as well so I can share with my followers! My husband puts beer in his chili but we haven’t tried Guinness. We will have to try it. Sounds great! Thanks for sharing at Saturday Dishes. Yum! 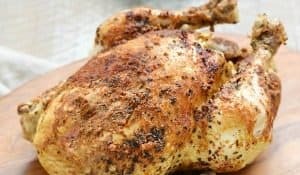 I love all the spices and seasonings in this and I’m sure the Guinness gives it an awesome pop of flavor, too!